Bit late to the party on this one, but it’s definitely worth noting. Chemists at a University in Japan are reporting the first artificially synthesised DNA molecule. 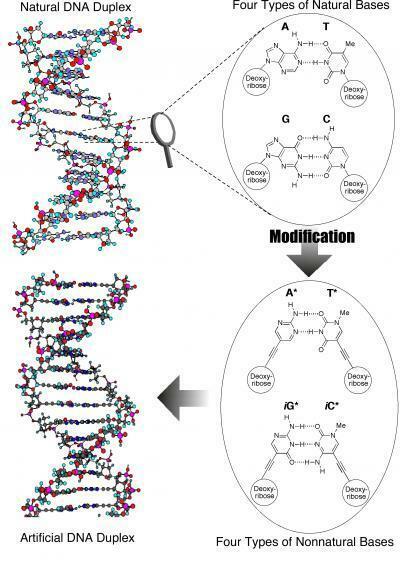 The researchers used high-tech DNA synthesis equipment to stitch together four entirely new, artificial bases inside the sugar-based framework of a DNA molecule. This resulted in unusually stable, double-stranded structures resembling natural DNA. Like natural DNA, the new structures were right-handed and some easily formed triple-stranded structures. The unique chemistry of these structures and their high stability offer unprecedented possibilities for developing new biotech materials and applications, the researchers say. Blacksunreview by Blacksun is licensed under a Creative Commons Attribution-Non-Commercial 2.0 UK: England & Wales License.